Earrings, earrings, and more earrings! Does any woman ever get tired of wearing earrings? Well, I never tire of making earrings. There are so many design possibilities and components to make beautiful ear jewelry, that one could make and wear a different pair daily and never run out of inspiration! 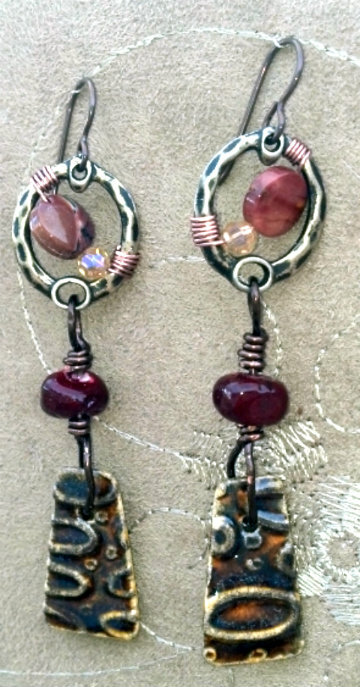 I must admit that my favorite type of earring to make and wear are long and dangly adornments. I cannot always wear that type, as most hospital-employed nurses, especially surgery nurses, aren't allowed to wear long and dangly in their work environment. So, I design those lovely long earrings to satisfy my love for and my desire to wear them daily! 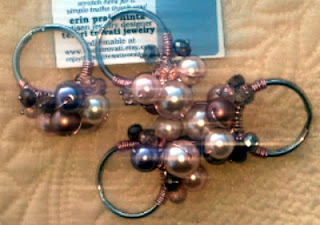 When the Art Jewelry Elements Earring Challenge was announced, I pounced upon the opportunity to participate! 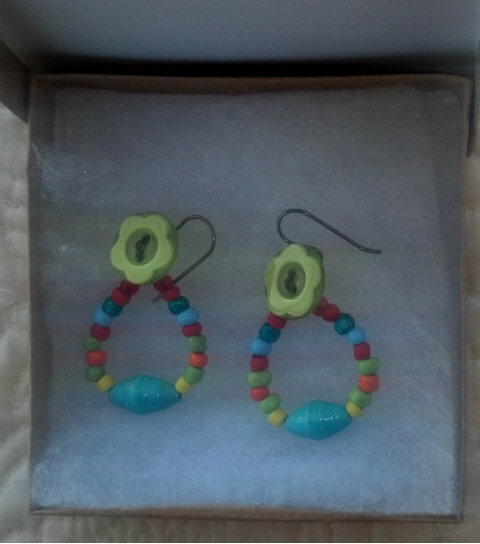 The Art Jewelry Elements team is sponsoring a year-long Earring Challenge in 2013 where participants will sign on for 13 weeks at a time to make one pair of earrings per week with an art bead or component that was made by another bead artist or by one's own hands! When we post the earrings, we then give credit to the artist that made the bead or component. Weeks one's earrings used components made by Marsha Neal, a wire-wrapped bronze link that includes a Mookaite bead and a Swarovski crystal by me, and a garnet glass bead with antiqued bronze wire and bronze Niobium earwires. 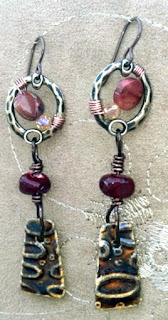 Week two, I made my own etched, antiqued copper component, and added jasper, Swarovski crystals, and Mahogany Obsidian bears from Magpie Gemstones hung on antiqued copper earwires. Stay tuned for weeks three and four, which I will be posting about here on February 3rd. Until then, may you find inspiration in the earring candy related to this challenge----I know I will! Lori Anderson created this blog hop because of a personal experience that you can read about here. Her friend, Marianna, passed away last year. Mostly quoting Lori to tell you what this blog hop represents--"this blog hop is for Marianna and for those people in our lives who mean a lot to us---family, friends, co-workers, or anyone who has meaning to each of us." This past month, one of my good friends--and a co-worker--was put into the tailspin of her life. Her husband was diagnosed with Stage 4 metastatic lung cancer, a diagnosis that had been missed almost 4 years earlier. He had a chest x-ray four years ago, it was on the film, and the radiologist missed it. He was her soul-mate, and died exactly one month after diagnosis. He suffered terribly, and my friend and her boys were devastated. There will be no funeral service, but there will be a celebration of life at his request. As I thought about what piece of jewelry that I could make, that would tell a story, I thought of my friend and her husband's request--a celebration of life! I decided that I would use mostly teardrop shapes, because tears represent most of life's challenges and celebrations! A bracelet came to life. Each bead, with each color and shape, as well as each teardrop represent some of the best things that have ever happened to me--the births of my children and grandchildren with their birthstones, each member of my immediate family, graduations, weddings, and new and better jobs. There are also some that represent the less joyful moments, but no less memorable or defining--Breast cancer for me, lymphoma for my Mom and Dad, other family members' struggles and triumphs, and grief. Thank you, Lori Anderson for inspiring the creation of this beautiful bracelet, a representation of my life celebrations. It will stay with me, perhaps later to be passed on to one of my daughters or sons one day. In the meantime, I will wear it and smile--perhaps cry a little sometimes--and Celebrate Life! Check out what everyone else created with the links below. 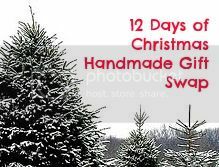 Back in November Lorelei Eurto drew 11 names for a 12 Days of Christmas Handmade Gift Swap, and along with herself the artists in the swap were to make 11 Handmade gifts and send them to each person in the swap. The gifts were to be opened, one each day, from the person whose name was assigned to that number. For example, I was assigned to the twelfth spot, so everyone would open my gifts that I sent to them on the twelfth day. We could blog about them each day, or wait until the last day and blog about them all at once. Today, I am going to reveal each of my gifts, beginning with the first day. I just want to say thank you to all of the incredible artists for the wonderful gifts that I received. It was so exciting to open a new present each day. I love them all! Thank you, Lorelei, for choosing my name to participate. I loved this swap! I am also still working on my photography skills, so please bear with me as I keep working to improve! The first Gift of Christmas, from Lorelei, was a jar of assorted flavored nuts, festively wrapped. 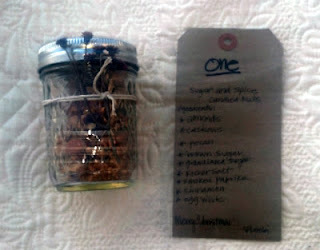 These nuts are so delicious, and I so appreciated the hand-written list of ingredients that she included! I was able to share them with my husband without fear that he would have an allergic reaction, since I knew there were no peanuts in the mix! Thank you, Lorelei! The second Gift of Christmas, from Lisa Johnson, is an ornament with a handmade copper wire hanger and some very colorful beads! Thank you, Lisa! I can think of several ways to use this so I can enjoy it all year and not have to wait for Christmas. The third Gift of Christmas, from Suzette Bentley ! These earrings are just adorable! I love how the button is used, and the colors remind me of candy. Thank you, Suzette, I will enjoy these and wear them often. The fourth Gift of Christmas is this little crocheted cuff from Jodie Marshall. I have gotten so many complements on this cuff! Jodie used one of her lampwork beads to embellish this cuff. The colors are perfect for so many outfits, and I absolutely love it. Thank you, Jodie! The chocolate was a sweet surprise and only lasted long enough to take the picture! 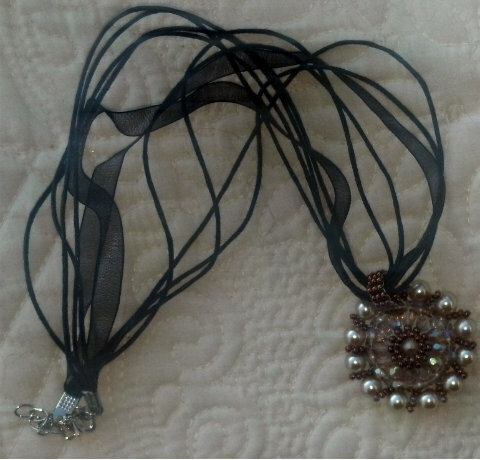 The fifth Gift of Christmas from Therese Frank is a gorgeous beaded pendant and necklace, the picture does not do it justice. I so admire Therese's beading skills! Beading is not one of my strong suits, it scares me!!! The colors are perfect, and I know I will find many occasions to wear this necklace. Thank you, Therese! The sixth Gift of Christmas is from Amy Freeland. 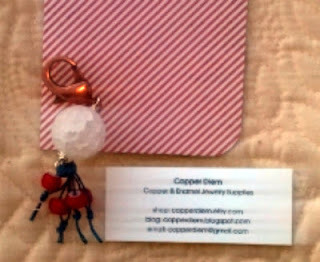 This little red, white, and blue key chain/purse jewelry/occupies a spot on my purse at the moment, but I can think of many ways to enjoy it! 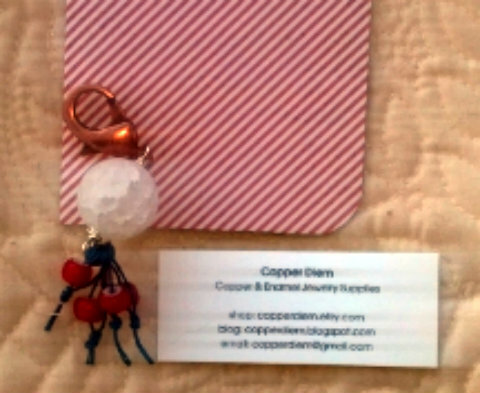 It is just adorable, with a big white frosted/crackle glass bead, blue cord, and red beads attached to a large copper lobster clasp. It's perfect, thank you so much Amy! Sadly, there is no gift for Day 7. Andrew Thornton had some technical "explosions" when making his gifts, so when it arrives, I will blog about it then. The eighth Gift of Christmas were from Erin Prais-Hintz, who made these napkin rings/place-card holders with some beautiful glass pearls and crystals. They are so elegant! Erin's instructions are available at Michaels. Thank you so much, Erin! I can't wait for the opportunity to use them! The ninth Gift of Christmas came from Melissa Trudinger. The ornament was made from a vintage chandelier crystal! Gorgeous and unique, this ornament will hang not only on my tree next year, but in my workroom the rest of the year. I can't bear to put it away till next Christmas! Also included was the beautiful blue snowflake from Melissa's mom! Of course, I am partial to snowflakes and will also keep this ornament in my sight all year. The card was so cute, I just had to include it in the picture. Thank you Melissa and Mom, these are true treasures! 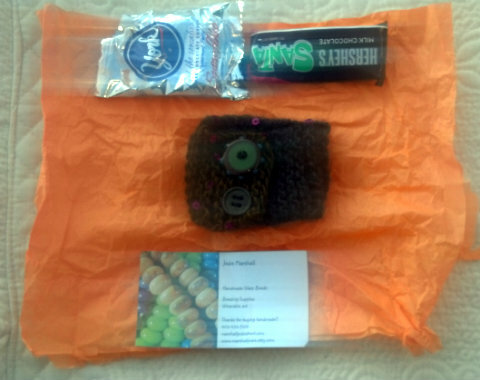 The tenth Gift of Christmas was a beautiful beaded ornament and extras sent by Rita, of Toltec Jewels. The package included the beaded crystal ornament, a pair of Christmas potholders/hot pads, the small fabric ornament, a sombrero ornament, and a Ceaseless Light candle from Mexico, as well as a jolly Christmas Card! The ornament is just too beautiful to put away, and my candle will be lit at the appropriate time. Thank you, Rita, I love the personal nature of your gifts, and know that they are from the heart! The eleventh Gift of Christmas was sent by Suzanne Reynolds. This lovely notebook and cover was handcrafted by Suzanne, and is so ingenious! The colors are so uplifting, and I will carry it with me every day. Thank you, Suzanne! The twelfth Gift of Christmas was my gift, so here is a little peek. I used copper sheeting, cut out ovals, hammered, sanded, patina-ted, riveted and assembled leather, copper, and gemstone beaded bracelets. This item was chosen because of it's versatility and because it would also be fitting for a male recipient! I hope you enjoyed the celebration and the Handmade Gifts. Please visit the other participants blogs and check out all the gifts received. Thank you again, Lorelei!